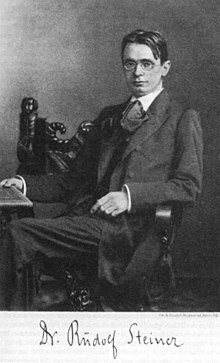 Rudolf Steiner (25 February 1861 – 30 March 1925) was an Austrian philosopher, literary scholar, architect, playwright, educator, and social thinker. He is the founder of anthroposophy, a spiritual movement that generated many practical endeavors, including Waldorf education, biodynamic agriculture and anthroposophical medicine. Where the realm of freedom of thought and action begin, the determination of individuals according to generic laws ends. The fundamental maxim of free men is to live in love towards our actions, and to let live in the understanding of the other person's will. Ethical individualism... is spiritualized theory of evolution carried over into moral life. Only to the extent that a man has emancipated himself...from all that is generic, does he count as a free spirit within a human community. No man is all genus, none is all individuality. We shall not set up demands nor programmes, but simply describe the child-nature. (...) Vague and general phrases — ‘the harmonious development of all the powers and talents in the child,’ and so forth — cannot provide the basis for a genuine art of education. Such an art of education can only be built up on a real knowledge of the human being. Not that these phrases are incorrect, but that at bottom they are as useless as it would be to say of a machine that all its parts must be brought harmoniously into action. To work a machine you must approach it, not with phrases and truisms, but with real and detailed knowledge. Cosmic Memory, Prehistory of Earth and Man. One of us, I no longer remember which one, began to speak of the spiritual decline of culture as the fundamental, unremarked problem of our times. We realized that both of us were occupied with this question; neither had expected this of the other. A lively discussion ensued. Each of us experienced from one another that we had taken on the same mission in life: to strive for the rise of true culture enlivened and formed by humane ideals, and to stimulate people to become truly thoughtful human beings. We took leave of one another in this consciousness of solidarity....We each followed one another's work. To take part in Rudolf Steiner's high flight of thought of spiritual science was not given to me. I know, however, that in this he lifted up and renewed many people, and his disciples attained exceptional accomplishments in many realms. I have rejoiced at the achievement which his great personality and his profound humanity have brought about in the world. Albert Schweitzer, Werke aus dem Nachlaß, 2003, pp. 229-231. How could he escape being hated with all the demonic power of which Hell is capable? Marie Steiner, Rudolf Steiner: The Story of My Life, Conclusion by Marie Steiner, 1925. ↑ Original: "Leben in der Liebe zum Handeln und Lebenlassen im Verständnisse des fremden Wollens ist die Grundmaxime der freien Menschen."